Heartbeat monitoring is required in all medical field and diagnostic. Today will share with you a new project called "Heartbeat monitoring". This paper describes the design of a simple, low-cost microcontroller based heart rate measuring device with LCD output. Heart rate of the subject is measured from the finger using sensors and the rate is then averaged and displayed on a text based LCD. The LCD of the heart beat monitor shows the beat per minute. You can also Subscribe to FINAL YEAR PROJECT'S by Email for more such projects and seminar using subscription box below. In this project, the sensor part consists of sensing elements, LDR (light dependent resistor), LED (light emitting diode),a comparator module, a low pass filter. Heartbeat in this system is sensed by the sensing elements and the comparator produces an amplified square wave output. 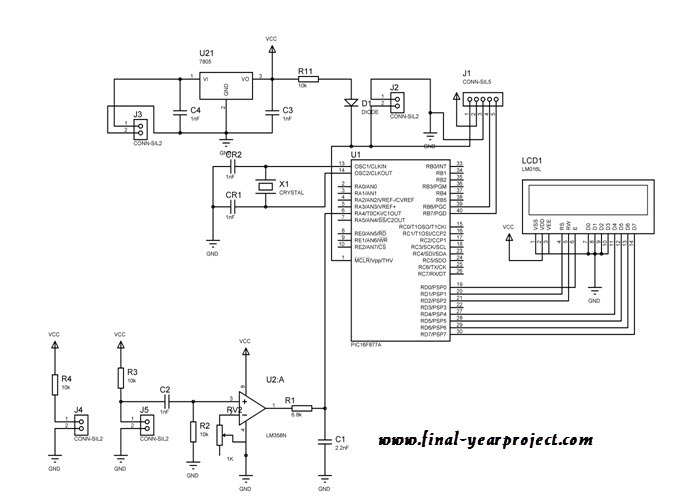 The comparator output is given to a low pass filter and the filter output is fed to one of the digital inputs of PIC 16F877a type microcontroller. The microcontroller output ports drives the LCD. Recommended Project : Biometric Heartbeat Monitoring system. The circuit basically consists of an operational amplifier, a low-pass filter, a microcontroller, and an LCD. The operational amplifier is set for higher values of gain. 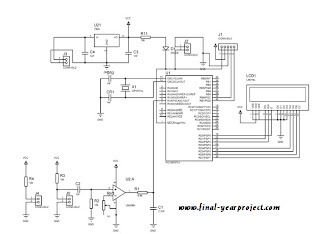 This project report includes block diagram, circuit diagram, microcontroller programming, working of the project and application of the project. Use this project for your reference and study work.